It’s San Francisco in the 1890s. John Quincannon and Sabina Carpenter have partnered up and formed their own detective agency: Carpenter and Quincannon, Professional Detective Services. 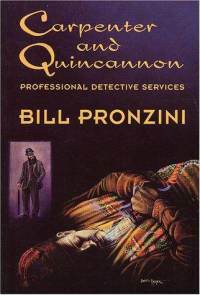 They have a bit of a reputation for solving bizarre crimes that are often impossible – see Carpenter and Quincannon: Professional Detective Services, a short story collection written by Bill Pronzini and published by Crippen & Landru. Well, Carpenter and Quincannon have now made their long-awaited debut in novel form, and Bill Pronzini was joined by his wife Marcia Muller (creator of Sharon McCone) to write The Bughouse Affair. As these cases often do, The Bughouse Affair begins as a relatively simple matter. Sabina Carpenter is hired to catch a ruthless lady pickpocket. Meanwhile, John Quincannon is hired to tackle a house burglar who seems to be working his way down an insurance company’s list. These cases have no apparent connection to each other, but after some investigation, the detectives realize that there is a connection between the two crimes. But almost on cue, a bizarre locked-room murder takes place, and the detectives are left with no clues. Into all this is thrown a crazy Limey who calls himself Sherlock Holmes. This is nonsense of course, since Mr. Holmes has been dead for a while now. But this bughouse Sherlock proves to be a constant nuisance, snooping around the crime scenes and looking for clues that probably don’t exist. This plot could overwhelm even the best mystery writers, but Pronzini and Muller make for an excellent team. I really liked following the story along. It starts off simply, but it slowly picks up more and more complexity until about midway through the book the locked-room murder occurs. It’s a good one, and I managed to be fooled—although I must confess I found it easier to solve the whodunit part. Still, when it came to the mechanics of the crime, I really should have known better. I suppose this round goes to the Mulzinis. The book is a fun read, but it can also be rather hardboiled at times. For instance, when Quincannon goes to the seedier parts of town to try finding a suspect, he occasionally has to throw his weight around to get the answers he wants. Meanwhile, Sabina keeps running into women who have been victimized by their society: elderly ladies and widows who are left to fend for themselves after tragedy strikes. Sabina’s compassion towards these women and her efforts to help them were truly touching and helped to make her a well-rounded, intriguing, and sympathetic female character. Maybe you’re thinking to yourself: “But how could it be? A man and a woman, not even married, teaming up as equal partners in a detective agency?? ?” The characters in this time period think it’s a strange arrangement and react appropriately. I think this angle of the book was handled very well. It’s certainly an unusual arrangement, but as explained by the authors it seems like a plausible one for this particular scenario. Oh, but if I keep going on about the detective duo I’ll forget to bring up the most delightful part of this book. 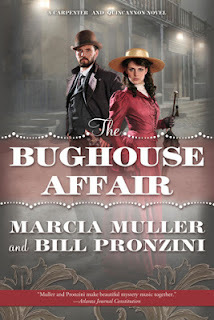 I thought that the “bughouse Sherlock” was a particularly delicious character, as Pronzini and Muller poked some good-natured fun at Mr. Sherlock Holmes. They don’t turn him into a buffoon or an idiot, but he does have a tendency to prattle on so, and occasionally his actions will lead you to seriously doubt his sanity, which is all part of the fun. So overall, I really liked The Bughouse Affair! It combines an interesting time period and a great detective duo with a tricky plot. The clues are all there and the reader is on equal footing with the detective. There’s a good locked room mystery. The historical colour is terrific. The Sherlock Holmes parody is quite funny. It’s a delicious book and a promising start to the series’ incarnation as novels. Here’s hoping they continue! Note: The audiobook edition of this novel is quite good. It uses two narrators, one male and one female, to narrate the perspectives of Quincannon and Carpenter, a move that works quite well. The male narrator, Nick Sullivan, does an uncannily good Sherlock Holmes impression, but I’m afraid the female narrator, Meredith Mitchell, does a much worse British accent. Despite that nitpick, it's an excellent recording overall. "Many thanks from Marcia and me for the compliments on Bughouse. Very pleased that you enjoyed the book and found the locked room puzzle rewarding. 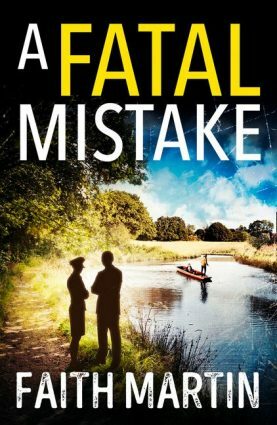 You could probably tell that we had a lot of fun researching and writing it, the more so because it's a considerable departure in style and tone from the Sharon McCone and Nameless novels which by their nature are more difficult to construct. We've delivered the second Carpenter and Quincannon, The Spook Lights Affair, which features a pair of linked impossibles and is expected to see print around this time next year, and are about to begin work on a third. We'd like to continue the series beyond #3, and will if sales are strong enough to entice Tor/Forge into giving us another contract. The bughouse Sherlock, incidentally, plays a much reduced role in Spook Lights, though he does supply a key clue to the solution of the crimes; our intention is to include him in each novel, but we don't want him to become a focal point of the series. There are more than enough SH pastiches being published these days." Nice! I'm going to review this too, though with some other things to get kind of a different vantage. Terrific review. Thanks for pointing to it from DorothyL. And, it was very nice to read Bill Pronzini's note saying there will be more books forthcoming. Great!